I know I've been gone for a while, but I am back for now & will continue to post as much as I can. I've decided to incorporate some of my art assignments into Make It Mondays. So each week I will feature one art project & one or two craft/side projects. First, in my Printmaking class we are creating book plates. Now book plates can range from this simple & more everyday one from janeray.com to the more traditional & intricate one in 2. 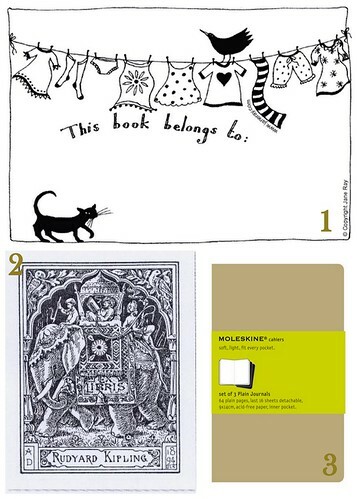 Go here to get 4 printable bookplates to keep up with your library of books. Finally I am going to decorate my notebooks for the year with scrapbook paper. I am also going to be blogging more about style. So look for that soon.